The California Highway Patrol is warning drivers of vehicles with auto-pilot technology about a dangerous and potentially deadly loophole. Some people are posting YouTube tutorials showing a "hack" of a vehicle's auto-pilot setting using a water bottle strapped to the steering wheel. 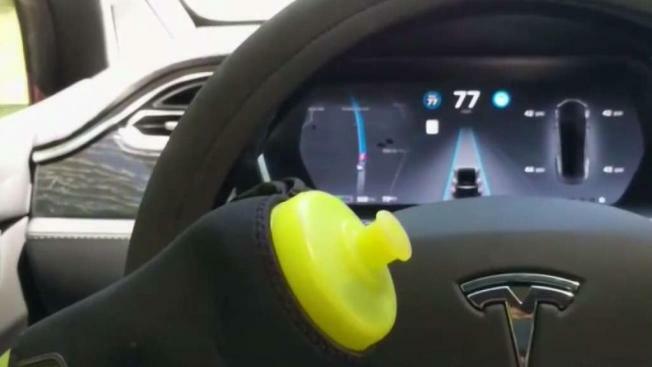 The videos are promoting the trick as a way to turn auto-pilot into a fully autonomous, as the water bottle fools the car’s sensors into thinking the driver still has their hands on the steering wheel. The auto-pilot mode is programmed to alert drivers if their hands are off the wheel too long, in case they’re no longer paying attention. "You have to put some resistance on it. Otherwise, it complains at you," one video says. The CHP says anyone caught using one of the tricks and driving carelessly will be cited. "This is supposed to be a driver assist feature that is going to basically assist the driver on making it easier on driving, but it’s not designed to let the vehicle do all the driving," CHP spokesman Art Montiel said. One video has been viewed more than 20,000 times, and there are others like it online. Some say to use an orange instead of a water bottle, wedging the fruit into the curve of the steering wheel. Tesla drivers in Mountain View said it isn’t something they would ever try. "I don’t think it’s right, especially if they’re promoting it and saying, 'Hey, you can use your phone while doing it,' etc.," Seema Mehta said. "So, no. I think it’s really careless and quite frankly stupid." Travis Johnson, another Tesla driver, agreed. "I’ve definitely heard of people not really paying attention when using autopilot, which also is not very smart," he said. "So this is kind of in the similar vain, right?" Last week, the CHP pulled over a Tesla Model S whose driver was asleep while the vehicle traveled about 70 mph in auto-pilot mode on Highway 101 through Palo Alto. The driver was arrested on DUI charges.